According to AMCBerkshire.org, there are 15 campsites and shelters along the portion of the Appalachian Trail that runs through the Berkshires. Privys and water are available at each; 2 night maximum stay; ordered north to south in this list. 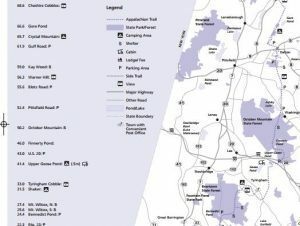 This Berkshires Appalachian Trail map displays approximate locations, but the AT is very well marked and maintained and you shouldn’t have trouble finding your destination, especially since most hikers today carry a GPS device with them while hiking. Wilbur Clearing: 0.3 miles west on Money Brook Falls Trail, 0.5 miles north of Notch Rd. Noepel Shelter: 2.8 miles south of Rockwell Rd. • Cabin is open with a volunteer caretaker in attendance from May 14th to October 23rd. Cabin is closed when no caretaker is present. • Prior to opening hikers may use the campsites on the approach trail to the cabin and behind the cabin. Tom Leonard Shelter: 1.1 mile south of Lake Buel Rd. Glen Brook Shelter and Campsite: 3.4 miles south of Jug End Rd. Hemlocks Shelter: 3.5 miles south of Jug End Rd. Next campsite (in CT): Sages Ravine, 1.9 miles south of Laurel Ridge.